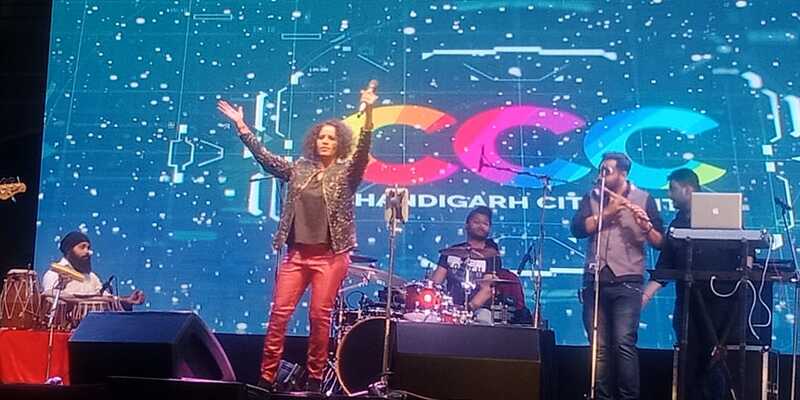 Mumbai-based multi-lingual singer Hamsika Iyer mesmerized Chandigarhians for the first time in a live concert held at Chandigarh City Center (CCC) here today. The versatile playback singer, Hamsika has sung songs for various Hindi, Kannada, Tamil, Bengali and Malayalam movies. Some of her popular songs include – Raabta (Agent Vinod), Chhammak Chhallo sung with Akon (Ra One), Ishq Barse (Rajneeti) etc. She has hit the top charts and still continues to bring good vibes when played. Hamsika is also a trained Carnatic singer, who has given her voice to many famous celebrities like Kareena Kapoor Khan and Deepika Padukone. She is omnipresent in every genre of Bollywood music, but her large repository of songs holds in Indian regional languages. She has worked with big names like Vishal-Shekhar, Shankar Ehsaan Loy, Pritam and many more. Not to forget, she also has a mammoth list of jingles in various television ads. Hamsika’s lifted the spirit of the audience with her item number – 1234 Get on the Dance Floor and few other popular tracks. The event was a private affair and the entry was strictly by invitations only. The event was managed by EventualyUs and Eagle Entertainment.